← Tales from the city- No Telly week one done! Happy St Paddy’s Day! There’s nothing more Irish in the world than an Irish Terrier. I love the red brick colour of the Irish, the dirty eye so crucial to the breed, a look of disdain and contempt, that without, I think would just make it any other dog. 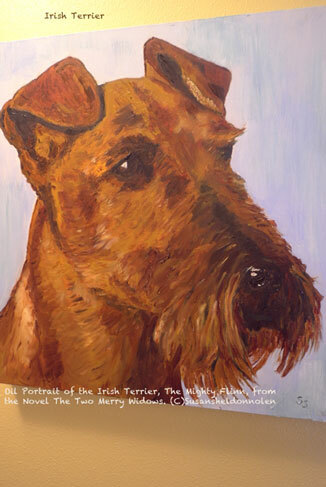 I’m currently working on an oil painting, a head study entitled “The Mighty Flinn” the father of Maggie Flinn, the fabulous Irish Terrier in my Irish romance novel, The Two Merry Widows. I’ve chosen this excerpt from my novel as it really demonstrates the classical Irish Terrier: Eleanor Blakemore is out on the Irish Beach to shoot photographs of the seal colony. An accident happens. She slips and falls on the rocks, angering and disturbing the seals. Eleanor froze at the sight of the huge male lumbering in her direction. Or was he? She glanced quickly at the other seals, some were sleeping, others were sounding the alarm and heading towards the water. But, there was no doubt, this one was lunging in her direction, uttering low warning calls, pounding the earth with his bulk, and thrusting his jaws. The sand shook beneath her feet. Her instincts kicked in and she scrambled back up on the rocks, trying to flee. She slipped on the slimy rock covered in seaweed and moss. A jagged shell sliced her hand. Ignoring her bleeding wound, she scrambled higher up the rocks. The ground underneath her moved from the weight of the pounding bull. Slipping and struggling on the wet stones, she fell. Turning over and out of breath, she reached for a rock to throw at the seal when a flash of red raced past her. Maggie Flinn now stood between her and the angry bull seal. Maggie bravely held her position in the sand, her tail straight up, her ears pulled back, barking and dancing around. She ran in to deliver a sharp bite and pulled back again. The seal turned his bulk towards the barking dog. ‘Maggie, get back here!’ Eleanor shouted. The wind stripped her voice of power. The dog that had pushed her head into Eleanor’s arms, her eyes so sweet and warm, eyes that loved the world and all in it, was now a red ball of fury. Maggie’s ears pulled back, and a deep rumble came from her throat, she showed her graveyard of teeth. Rage shook in her body. Every inch of her was tense, even the ends of her coat, each hair bristled straight up with furious electricity. Eleanor balanced on the rock, stood still, frozen with fear. This can’t be happening. But it was, and she needed to do something to help Maggie. She bent down to grab a larger stone. It was impossible to get a clear shot for Maggie Flinn stood in front of her, a rock of red rage. The bull seal lunged forward. His one eye rolled back as he roared, revealing the white of the eye. His mass rolled back and forth under his skin as he moved. Maggie Flinn lowered her head and barked her fury at the threatening seal. Maggie flew at the seal, coming within inches of the whiskered snout. The seal with teeth sharp enough to kill with just one bite, lunged, barely missing Maggie’s left flank. Maggie snarled, spun around and went after the seal. Dancing in front of the moving bulk like a trained boxer, she ducked his dangerous lunges. Eleanor slid off the rocks onto the sand and ran towards Maggie, screaming and waving her arms at the seal. Reaching down, she grabbed a rock and threw. It fell short of the seal, but it was enough of a distraction for Eleanor to grab the dog and pull her back. Maggie Flinn throbbed with anger. Her body shook with the fury of each bark. Eleanor struggled to keep Maggie Flinn in her arms, but Maggie Flinn fought even harder to get free. Her paw madly swiped at the air and then scratched Eleanor’s cheek. A large welt sprang up. Then with a frantic wiggle, and push, Maggie Flinn leapt from her arms and raced back towards the seal. ‘Maggie!’ Eleanor screamed into the wind. The dog charged at the seal again. With a low roar, the seal lunged and hit Maggie with its snout, sending her flying onto a nearby rock. And we’ll leave it there for now. The Irish Terrier is an interesting dog. The Irish Terrier was once called the Irish Red Terrier to mark it apart from the other terriers in Ireland striving for recognition. The breed was first shown in 1875 with a wide variation of type. 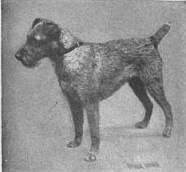 They were a sorry looking mixed lot, but still the early Irish was a hard biting terrier with a variable kind of jacket, sometimes sporting the deep red and hard texture of coat, and others with the undesirable soft and light coloured jackets. The breed was in its making and as with all breeds the fine tuning slowly came about. 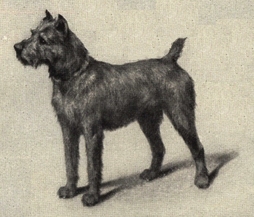 Fanciers soon formed the first Irish Terrier Club in 1879 for the purpose of the protection and advancement of the breed. These fanciers with great foresight and humanity, discussed at their first meeting in 1880, the heated topic — the cropping of ears. They can be credited and applauded for their work in the abolition of cropping ears in 1888, prior to which, the cruel and barbaric practice sliced off many a dog’s ear with a sharp knife against an old tree stump. Many breeds suffered from the abolition of cropping and disappeared, but take the Bull Terrier, a classic example of what breeders can do when they set their mind to it. It too suffered a decline, but dedicated breeders soon had the hard prick ear they so loved and now we have a pricked eared Bull Terrier. So too with the Irish Terrier, instead of fading away to dog history, the little brick red dog became the racy red dog we know today. The typical Irish Terrier is neither too large nor too small. They are larger than a Wire Fox Terrier and smaller than an Airedale, sort of a perfect size to do the job they were bred to do. He is the perfect farmer’s companion and work friend, originally bred to guard the home, rid the barn and sheds of rats, and if need be accompany the man on a poaching outing. Life was hard for man and dog, but the Irish Terrier coming home after a day of work still had room in his big heart to lie by the peat fire with the farmer’s son pulling at his ears. Such is the Irish Terrier versatility. As with most Terriers, the breed’s exact origin is lost to time, but it is believed to have descended from the black and tan terrier type dog. My first Irish was given to me by a Monseigneur, who in my early days of dogs, thought I ought to have a proper dog, and hence Paddy came into my life. Paddy was one of those rare dogs that taught me more about life than any university degree could do in his short time on earth. He lived to the ripe old age of 13 and died in my arms. It was a heartbreaking moment with his deep brown eyes looking at me…well…it was almost impossible to bear. Paddy came from Northern Ireland from the famed Slemish Kennels. He was a stallion of a dog, ready to fire on a minute’s glare, treading lightly on the tip of his toes, and the next — play a silly old stuffed dog. He was handsome, hardy, brave, and loving with dark brown eyes possessing that famous dirty expression, a fiery look to all that dared insult him. Irish are active dogs, not the kind of dog to sit around and wonder what is going to happen next, an Irish makes what’s next happen. My Paddy could be lying on his back, tongue hanging out, embarrassment to all onlookers, but at the slightest noise, he was another dog. On his toes and raring to go. They need a strong leader, a person who owns an Irish needs to be certain of his role in life. To not be so, would be to let an Irish Terrier down. Although they are highly trainable, they are not as bid-able as a Border Terrier, the desire to fawn is not in them. They are again like the Fox Terrier, an independent thinker, and expect their owners to understand this. They expect kindness and respect as that is what they offer to man. Their coat is one that needs to be stripped, I find them easier to groom than the Wire Fox, there’s just less hair to deal with. The pet dog only needs to be stripped twice a year. My Paddy’s coat was so hard and wiry, I only stripped his coat every 8 months. The Irish Terrier is a brave dog, he knows no fear. During man’s horrific battles during World War 1, animals were used on the actual battle field. “I can say with decided emphasis that the Irish Terriers of the service more than did their part. Many a soldier is alive today through the effort of one of these very terriers. My opinion of this breed is indeed a high one. They are highly sensitive, spirited dogs of fine metal, and those of us who respect and admire the finer qualities of mind will find them amply reflected in these terriers. They are extraordinarily intelligent, faithful and honest, and a man who has one of them as a companion will never lack a true friend”. The Dare Devil is one of the most common monikers for this breed. Pluck, stout hearted, and big hearted are probably three perfect words for this dog. My big brave Paddy used to make me laugh when rain drops fell on him. He picked up his feet as if walking on acid if I watched him, if I wasn’t about, he went rollicking in the rain. He’s not a surly dog, like certain terriers prone to pouting, he’s good tempered, but a little too ready to resent interference from other dogs. He’s not a dog I would let a child walk on a city street. Every great dog comes with his people, Paddy and his friends taught me about dogs, but also about the history of Ireland, the love of a land, and the love of a dog. Jack London wrote about his Irish in Jerry of the Islands, and Michael Brother of Jerry. 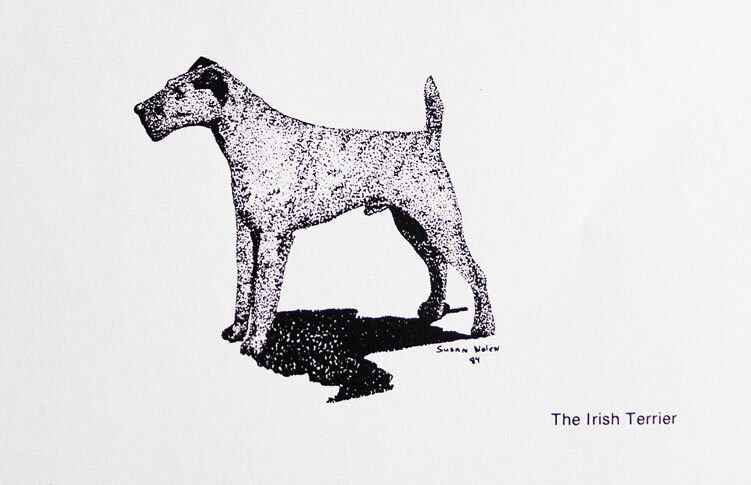 My Paddy was the inspiration for Maggie Flinn, so highly typical of all Irish Terriers, she is soft, loving, full of trouble, but when the chips are down, Maggie is there by your side. Here’s a loyal salute to my first Irish Terrier, Paddy, long since passed to dog heaven, you will never be forgotten and may you live on in Maggie Flinn. 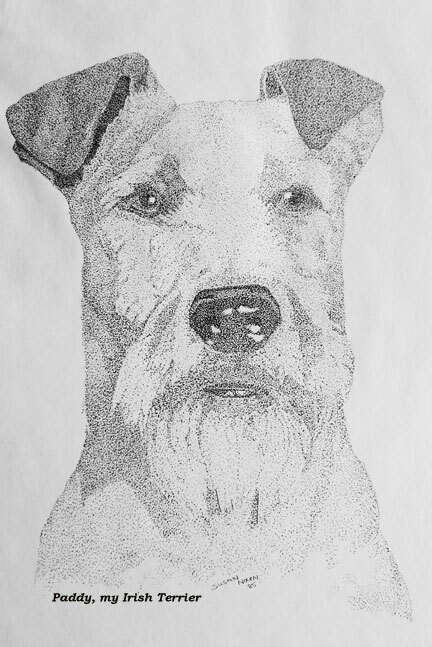 Gallery | This entry was posted in Art, Books, Dogs and tagged Bull Terrier, Dog, England, Ireland, Irish Terrier, Northern Ireland, Saint Patrick Day, Slemish, Terrier, Wire Fox Terrier. Bookmark the permalink. You can’t leave the story there…. Thanks Kate..I have a massive soft spot for these terriers!